Edinburgh's Old Town grew within the city wall and in the shadow of Edinburgh Castle, along the spine of the steep-sided ridge. When space within the city wall ran out, developers built upwards. As a result Edinburgh became home to the world's first high-rise buildings and, for a time, had the highest population density on Earth. The focus of the city was "The Kingis Hie Street", which today comprises Castlehill, Lawnmarket, and High Street. This ran directly down the line of the ridge from Edinburgh Castle at one end to the Netherbow Port at the other. Beyond the Netherbow Port (in effect the east gate to the city) a street carried on downhill along the same line through the separate burgh of Canongate as far as the Palace of Holyroodhouse. Today the whole length of this street is often referred to as "The Royal Mile": it takes an effort to recall that initially only its top, western, half was considered to be part of Edinburgh. Within the city, a series of wynds (lanes) and closes (alleys) ran down the sides of the ridge at right angles to the Kingis Hie Street. Plots of land were purchased, mainly by merchants, on the sloping sides of the ridge. These plots were known as tenements, and the buildings that came to be erected on them were called lands. By the 1760s the Old Town had become so overcrowded and squalid that Edinburgh's nickname of Auld Reekie was well deserved, and work began on the building of a new town on a huge greenfield site to the north: thus was born Edinburgh's "New Town", as it is still known today. With the arrival of the New Town, anyone able to afford to move to it from the Old Town did so, leaving the old heart of the city to decay further into slums and squalor. It was the end of an era in which everyone, rich and poor, lived closely together, often occupying different floors on the same "land" or building. Over the following 200 years, far too many of the unique buildings that once - literally - packed Edinburgh's Old Town have been lost in the cause of "improvement". But some of the original Old Town still remains, in the form of the dense pattern of wynds and closes that fall away either side of the Royal Mile, and, in a few cases, in the form of original surviving buildings. 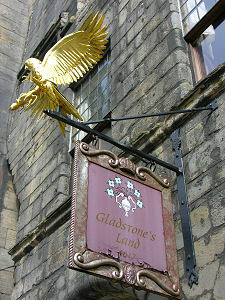 Gladstone's Land, a six storey building that stands on the north side of Edinburgh's Lawnmarket, not far down the Royal Mile from Edinburgh Castle, is the most important of them. Gladstone's Land has its origins in a building probably built in the latter part of the 1500s in a position 23ft further back from road than today's building. This probably had wooden galleries at different levels along its front, allowing residents to take the air without the need to wade through the open sewer that was the street itself. 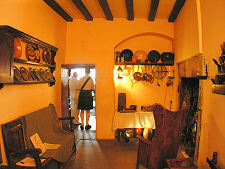 On 20 December 1617 the property was purchased by Thomas Gledstanes and his wife. Like other owners of other properties along the "Kingis Hie Street" at the time, he built an extra room onto the front of each storey of the house, moving its frontage 23ft out into what as a result became a very much narrower street. This must have been part of an officially sanctioned policy to increase the amount of accommodation available within the overcrowded city. By the 1930s Gladstone's Land had become an overcrowded slum unfit for habitation and it was scheduled for demolition in 1934. The National Trust for Scotland responded by buying up parts of the building as they became available, until it eventually came to own the whole edifice for the total price of £762. 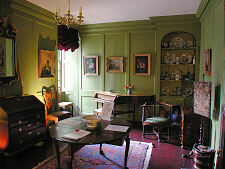 Over the years since, extensive restoration has taken place which has returned much of the property to something that would have been recognised by Thomas Gledstanes, stripping away three centuries of subdivision, of alteration, and up to fourteen layers of paint or other wall coverings. In the process the restorers discovered the original superbly decorated ceilings still in place hidden beneath later coverings; and they returned the windows to their original pattern, comprising glazed upper portions, and wood shuttered lower portions. Entering Gladstone's Land today is like entering a time machine that transports you back to an age before the development of the New Town, to a time when rich and poor lived cheek-by-jowl in a seriously overcrowded city. The building comprises six storeys. All are be accessed using a turnpike (spiral) stair that climbs up the rear of the building, and all except the ground floor can be accessed by another stair that enters the front of the building at first floor level. 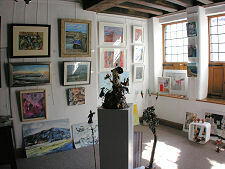 The ground and first floors are the main areas open to the public, though a second floor gallery, Gladstone's Gallery, has been created on the second floor, and this is let out to artists to show their work during the peak summer season. It is the only part of the house now normally accessed by the stone staircase projecting from the front of the building into the street. 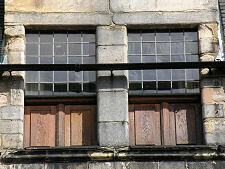 At ground floor level, the front of the building is arcaded. This would have allowed pedestrians to pass along the street under cover. It would also have served as home to any livestock kept by the building's owner. 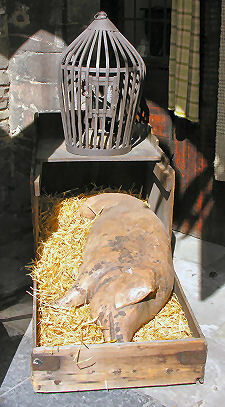 A pig was often kept which would have survived by foraging amongst the rubbish in the street. 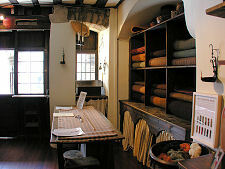 Within the building, one side of the front of the ground floor is occupied by the National Trust for Scotland reception area, while the other has been transformed into a cloth merchant's booth, typical of the shops that would have lined the main street. 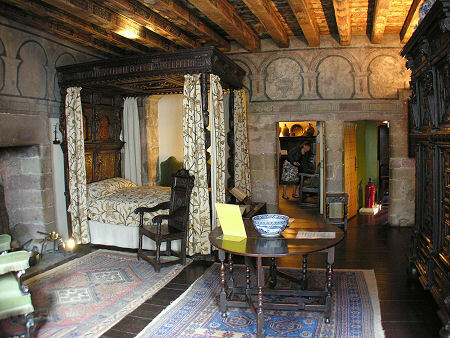 Further back, an inner hall gives access to the rear stairs, which you use to climb to the first floor. 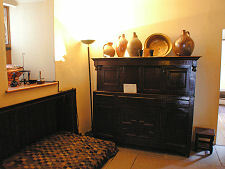 Here a series of wonderfully restored rooms present a unique slice of Old Town life. The highlight is The Painted Chamber, a bedroom that comes complete with some of the best original ceiling and wall decoration in Scotland. 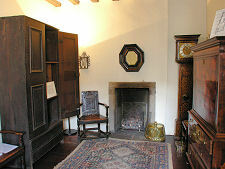 Nearby is the main living room, The Green Room, while elsewhere on this level is a kitchen, with a fold out bed for a servant, and other recreated rooms that complete the accommodation. Your descent to the ground floor brings a surprise. You emerge in The Bar Parlour. 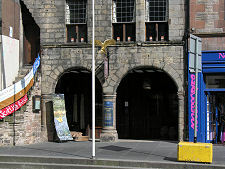 When the NTS purchased the building in 1934, they acquired a sitting tenant in the form of a room occupied by the pub next door, The Robbie Burns Bar. This remained part of the pub until the latter closed at the end of the 1950s. 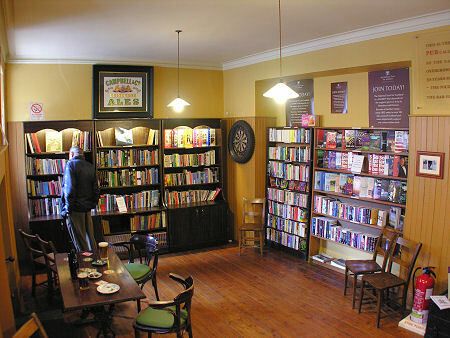 Today the room retains reminders of its life as part of the pub, and also serves as a second hand book shop. 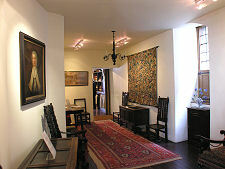 Those wanting a glimpse of the New Town life the rich left the Old Town to enjoy can visit The Georgian House in Charlotte Square, also cared for by the National Trust for Scotland. Pigs lived by scavenging in the street.